This is one of those meals that was invented when I was using up the contents of my fridge and cupboard. My kids didn’t turn their noses up at it so it is a success in my book! 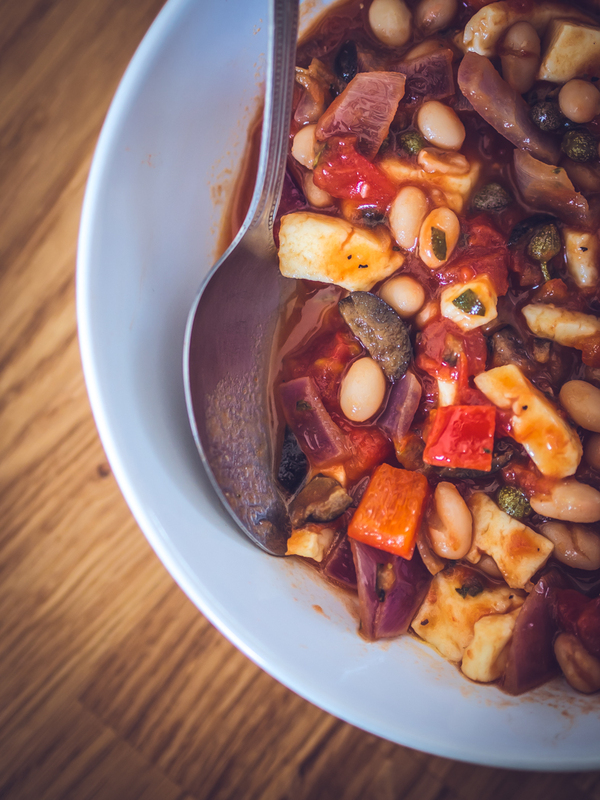 They loved the natural saltiness of the halloumi cheese and the Mediterranean flavours of the capers and olives, so much so that they happily accepted the presence of the beans and vegetables. My boyfriend approved too (if you read my blog regularly you will know that he normally only gets excited by fish fingers and Rustlers burgers). This dish is healthy, tasty, colourful and quick so makes a perfect family meal! Allow about 20 minutes to make it. Heat some oil in a pan and add the crushed garlic, herbs, and chopped onion and pepper. Sweat for at least 7 minutes, until softened, stirring regularly. Add the chopped tomatoes, drained beans, halloumi cheese, capers, olives and crumble in the stock cube. Season with salt and pepper. Simmer for 5 mins. Serve!